The Dictionary Mixtape Society Strikes Back! As you probably know, I don’t plan on doing another Mix-Tape Trade anytime soon. 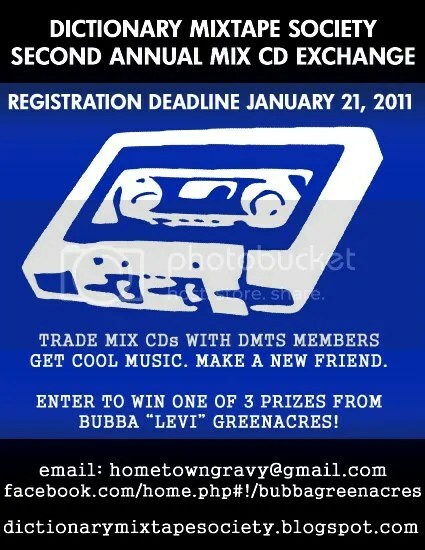 However, CDP alumni Bubba ‘Levi’ Greenacres is, and if you’re looking for a Mix fix, I implore you to sign up for his (well-ran and CDP-endorsed) Mix Trade. Everything you need to know is above; just sign up before the deadline and you’re good to go. The theme is ‘Songs Every Kid Should Hear Early.’ As Bubba describes it, “Not necessarily music for kids, but music that helped you along at any point in your personal growth, or songs you would give to a kid now to help blow their mind before it’s too late.” As always, decent flow, creativity and presentation are encouraged (and just like the CDP Trades of old, anything sent to Bubba will be eligible for a prize). This sounds like fun, and I’m on board as a participant. If you’re interested in signing up, let Bubba (not me) know by the end of the week. A new CDP post arrives tomorrow; thanks much. < Previous Tat’s All, Folks. Next > Everything Went Exactly As Planned.